MUFF WIGGLER :: View topic - Argos Bleak - what do we know? Argos Bleak - what do we know? I've seen the name Argos Bleak being mentioned. 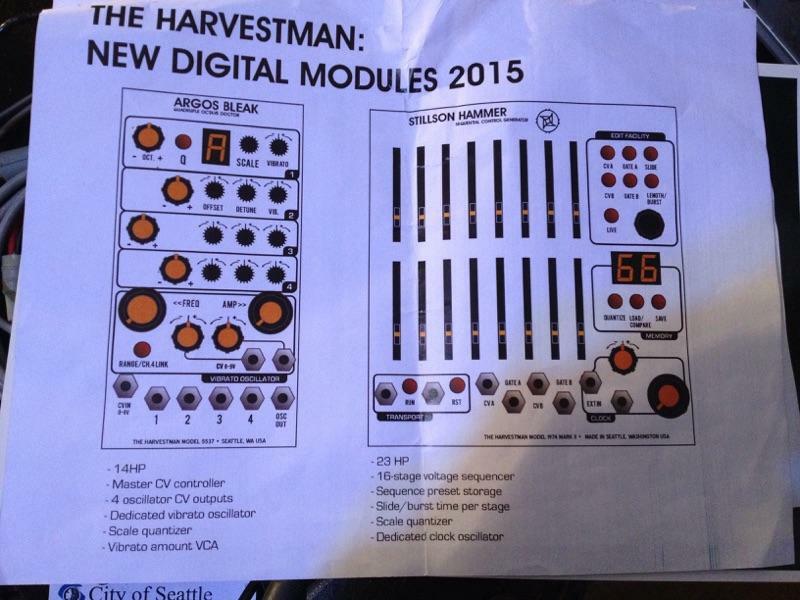 It was mentioned in an FB post by Harvestman (I think it was on Facebook, anyway), in conjunction with having to re-calibrate oscillators (for Stillson 2 and Argos Bleak) - so could we assume it's some sort of sequencer as well? Quantizer? Something else that has to do with pitch tracking? "Base frequency and range reset for use with Argos Bleak and Stillson Hammer Mark ]["
Triggering thing? CV Back-Massage unit? Antiquantizer? Ransom note composer? as compared to the final versions. you should be able to get a better idea of the argos bleak from this pic. i would assume it's highly subject to changes though. it's one of the new batch i was really looking forward to. Damn! Thanks for posting, starfision! That looks pretty interesting. Argos Bleak is a 4-channel oscillator driver module that will have a detailed announcement made after NAMM. I made the decision to increase the panel width to 15HP, having decided that expansion modules are insulting to the customer in all but the most exceptional circumstances. The module allows for semitone/fine tune/vibrato/slew of all connected oscillators and uses the same quantizer engine as the new Stillson Hammer. The semitone offsets per channel are programmable as presets, stepping through them becomes a chord sequence. The 13HP module you see above has existed for a very long time, but I think it could benefit from some extra space and some minor control revisions. I personnally dont mind expansion modules. It brings possibilities steps beyond the lonely module. Scott is saying that it is better to have all the possibilities already on the main module instead of saving a few hp and relegating the extras to an expander. Damn. Nice! That sounds great. But it won't do octave switching? In case anyone was wondering, Argos Bleak is a character in Captain Planet. Thanks! Here's the old names thread. Excellent exegesis. The references are obscure to me. This one has me interested! So, is this sort of a shift register in a way? If one were to feed the oscillators with the same pitch sequence and run their outputs through the AB, you could in theory get 4 different melodies? If one were to feed the oscillators with the same pitch sequence and run their outputs through the AB, you could in theory get 4 different melodies? 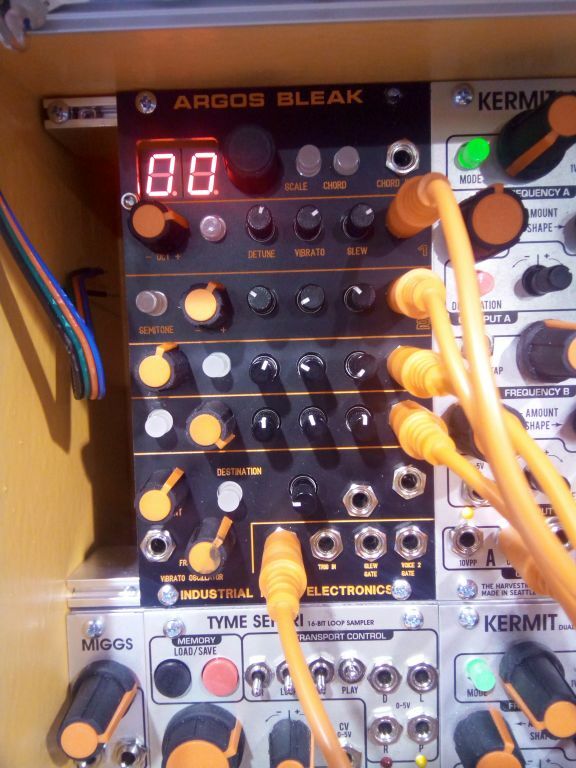 Argos Bleak processes CV rather than audio, so you'd feed the sequence to the oscillators via Bleak. But if you fed a sequence into Bleak, it will give you four versions of that sequence which will differ depending on the settings for the respective channels (slew, offset, vibrato, etc.). Thanks for responding. I'll be putting it on the list of potential purchases for 2017. I'll wait for the cost and budget accordingly. Sigh. Some Argos Bleak discussion here. High anticipation for this one. I hope they keep the black panel. It contrasts nicely with yellow. I really doubt it will stay black. Usualy it's for the prototypes. Join me in bombarding Guv with requests for blackpanels made available on the IME store.